We pit the beaten-down niche fitness-tracker leader against the consumer technology powerhouse that's trading near a record high. 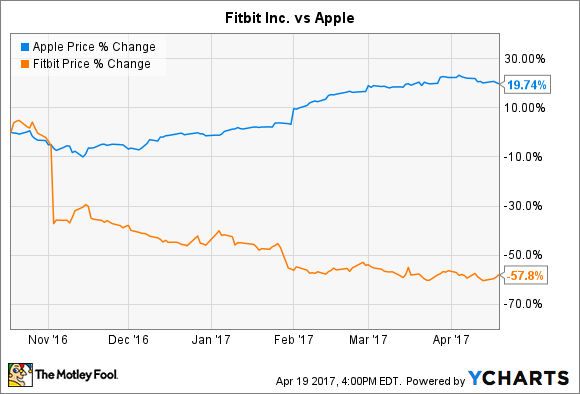 If you're in the market for a wearable fitness tracker, odds are you're probably trying to decide between a Fitbit (NYSE:FIT) and an Apple (NASDAQ:AAPL) Watch. The two companies were in the top three wearable manufacturers for 2016, according to IDC. Fitbit led the segment, selling 22.3 million devices last year, while Apple only sold an estimated 10.7 million Watches. But Apple also has a huge iPhone business, not to mention the revenue it generates from iPads, Macs, and the various services it offers to support its devices. The stocks, though, have moved in opposite directions over the past six months. Apple shares are up about 20% and Fitbit shares are down almost 60%. Fitbit started falling after it gave a disappointing fourth-quarter outlook, which it proceeded to miss. The company's outlook for 2017 kept the stock price from tanking further earlier this year. Apple, by contrast, continues to provide steady results, and the stock hit an all-time high in recent weeks. So which makes a better investment today: the beaten-up niche player or the consumer technology giant trading near a record high? When Apple announced the Apple Watch in 2014, CEO Tim Cook described it as "a precise, customizable timepiece," "an intimate way to connect and communicate," and "a comprehensive health and fitness companion." As it turns out, consumers care most about that last one. The company took that to heart in its second iteration of the Apple Watch, focusing heavily on the fitness tracking aspects of WatchOS, and adding new hardware features like GPS and water resistance. As full-feature smartwatches like the Apple Watch improve their quality as fitness trackers, fitness trackers (which were once glorified pedometers) are evolving more into smartwatches. In fact, Fitbit plans to launch a true smartwatch at some point this year. Unfortunately, production delays have pushed the launch back into the fall, about the same time the next model Apple Watch is expected to debut. Meanwhile, traditional watchmakers like Fossil (NASDAQ:FOSL) are entering the smartwatch market. Fossil is targeting fashion-conscious consumers with mid-range devices. The influx of new manufacturers and a broad trend by smartwatch makers toward giving their devices better fitness-tracking functionality will put a lot of pressure on Fitbit. And its device sales already declined 20.7% in the fourth quarter. Fitbit has brand recognition and an early mover advantage, but it's competing with some huge tech and fashion companies now. For Apple, a relatively new competitor in the wearables market, the influx of competition in that arena is less of a problem. Only a minuscule portion of its revenue comes from the Apple Watch, so a few lost sales won't make a dent in the company's top line. While the market has good reason to have pushed down Fitbit's share price in recent months, sometimes it can take things a little too far. Let's compare Fitbit's valuation to Apple's to see how they stack up. Fitbit's valuation has tanked along with its stock price. The company's enterprise value/revenue ratio is a bit skewed due to the expected decline in revenue this year, but it's still trading well below 1 on a forward-looking basis. Importantly, Fitbit is also seeing declining gross margins as competitive pressures force it to slash prices. So the sales its making aren't as valuable as they used to be. Apple's valuation, meanwhile, has crept up recently with the expectation the Trump administration and Republicans in Congress will enact a repatriation tax holiday and lower corporate taxes. That would allow Apple to bring back the billions of dollars in profits it has been holding overseas without paying taxes on it, pay off some debt, return more capital to shareholders, and invest more in R&D. Analysts are also anticipating a big iPhone refresh cycle this year, with a potential 10th anniversary special edition iPhone in September. Yet despite all those reasons for optimism regarding the company's future, its valuation remains relatively modest. Fitbit trades for lower valuations than Apple be nearly every measure except for P/E (Fitbit has negative earnings) and price/free cash flow. Apple is a cash generating machine while Fitbit has seen its cash flow plummet in recent quarters, when it has struggled to sell as many devices as it was used to. Apple's cash flow supports a modest dividend, but management plans to increase it every year. Looking forward, I expect Fitbit will continue to struggle to sell as many devices as investors anticipated a couple years ago when it IPOed. While its valuation is attractive, its growth prospects don't make it an appealing investment option. I'd rather buy shares of Apple, which should steadily feed the cash generating machine and pay out an increasing dividend year after year.